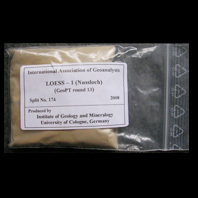 The loess material was collected from Nussloch, 10 km south of Heidelberg and 3 km east of the upper Rhine Graben, Germany (217 m above sea level). The basement of the loess consists of Middle Triassic limestone and dolomite (‘Muschelkalk’). The main section comprises 16 m thick loess deposits from the Würmian. 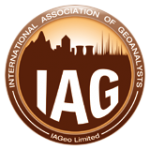 The sample was collected from the upper Würmian loess which was deposited as part of the last glacial – interglacial cycle, 15,000 – 20,000 a BP. Examination of this sample indicates that the main mineralogical components are quartz, feldspar, carbonate phases, mica, clay minerals and iron-rich minerals. The sample also contains accessory zircon, rutile, tourmaline, anatase, brookite, garnet, epidote and amphibole.